Rules Don’t Apply is Warren Beatty’s first appearance in front of a camera since 2001’s Town & Country—and his first appearance behind a camera since 1998’s Bulworth. That probably explains why the flick is filled with so many familiar faces. 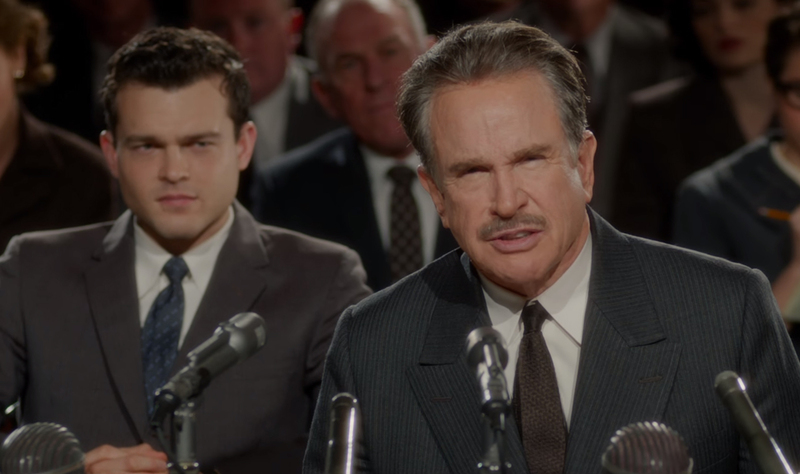 Frank Forbes (Alden Ehrenreich, left) listens as Howard Hughes (Warren Beatty) testifies before Congress in Rules Don’t Apply. Paul Sorvino, Matthew Broderick, Candice Bergen, Martin Sheen, Oliver Platt, Ed Harris, Dabney Coleman and Annette Bening (aka Mrs. Beatty) are among the veteran A-listers who apparently were eager to take part in the actor/director’s return to the silver screen. That makes it ironic that two of the younger cast members emerge as the best reasons to see a tale based on a late chapter in the life of eccentric billionaire Howard Hughes. 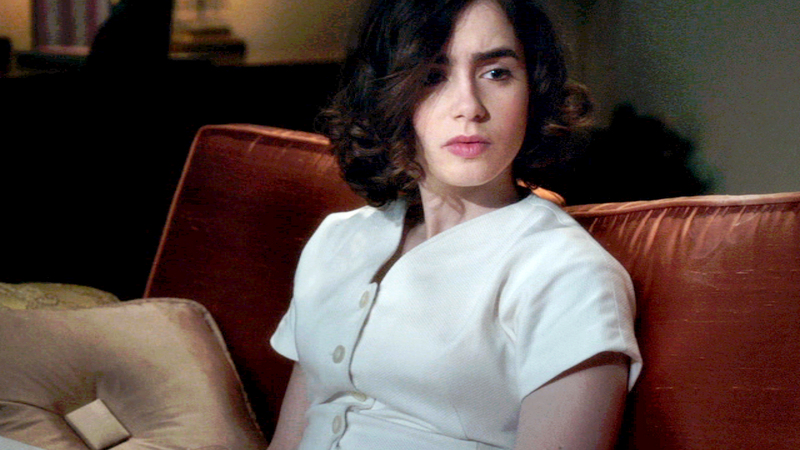 Lily Collins and Alden Ehrenreich have appealing chemistry as two people in Hughes’s employ: Marla Mabrey, a would-be starlet, and Frank Forbes, a driver who’s assigned to chauffer her around. Because both Marla and Frank are devout Christians—and more particularly because Hughes forbids them to have anything but a professional relationship—that chemistry has plenty of time to percolate as the two are forced to sublimate their growing attraction for each other. Beyond this budding romance, the film offers Beatty fans the pleasure of seeing the ex-matinee idol’s take on the secretive and exceedingly bizarre Hughes. But beyond that, it offers very little. Set primarily in Hollywood in 1959, Rules Don’t Apply reveals Hughes’s odd penchant for signing contracts with young actresses who are given sumptuous housing but little opportunity to launch a film career. When Marla arrives along with her equally Christian mom (Bening), she’s said to be one of perhaps 26 such women who wait around for an opportunity that almost never comes. It’s a fascinating situation, whether or not it’s entirely accurate. (The movie begins with a Hughes quotation advising us to “Never check an interesting fact.”) But the film built around that situation is frankly a mess. Early scenes end so abruptly and pointlessly that you have to wonder what the editors were thinking. Later, after Hughes emerges from the shadows, the film takes a long detour into his chaotic life that is as frustrating for us as it seems to be for the underlings who are forced to share it. Throughout, consistent tone is conspicuously absent. Early developments and sumptuous visuals, including fleets of shiny vintage cars, help to establish a mood of affectionate nostalgia. But the script (co-written by Beatty) has no qualms about switching to broad comedy when chauffer Frank finally lets Marla take the wheel, only to watch her morph from a cautious and conservative young woman to a highway terror. Collins’s character undergoes another transformation for the sake of a later plot point. Though a demure teetotaler, Marla turns into a booze-guzzling vamp the first time alcohol passes her lips. Despite being every parent’s worst nightmare, the scene just doesn’t ring true. Like his many co-stars, Beatty’s fans will no doubt be glad to see him back after so many years of absence. But they might wish he’d taken a refresher course in filmmaking before attempting his return. Rules Don’t Apply (PG-13) opens Wednesday (Nov. 23) at theaters nationwide.